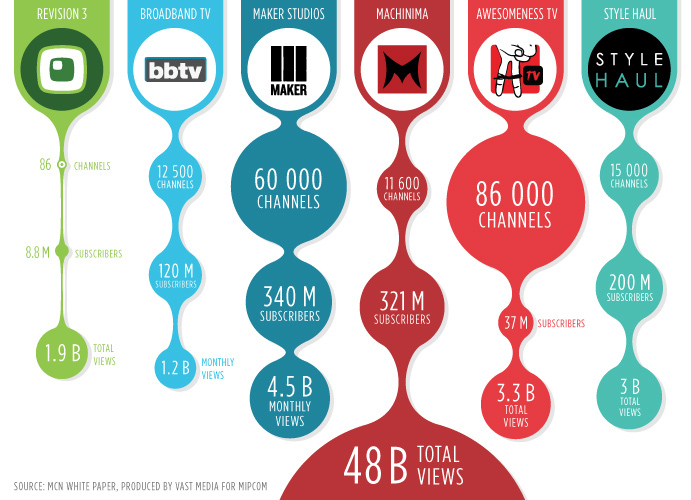 Why the TV Networks should start their own MCNs. While Hollywood was sleeping against a backdrop of cat videos, the democratization of media delivered power back into the hands of the content creators. Multi-Channel Networks (MCN), a combination of digital channel curators and digital talent agents jumped at the opportunity to sort the (YouTube) wheat from the chaff. The MCNs signed on the best talent and aggregated those channels under their umbrella to claim reach and influence in the hundreds of millions. Most Millennials now recognize and follow digital talent way ahead of those on TV. The balance of power is shifting. In response, traditional networks are scrambling to stay relevant by incorporating digital content into broadcast shows as they start to sign digital talent, many of whom are represented by the MCNs. Advertisers have started to take notice. …but this is just the beginning and developing great content is hard…really hard. Look at how few shows make it through TV pilot season and how only a select few influencers amongst the tens or maybe hundreds of thousands shooting for digital fame on YouTube actually make it. In some sense, the MCNs are a house of cards as they have no IP within the content or with the creators themselves. In most cases contracts are short-term and a creator can leave at any time. The value that an MCN brings a creator is hotly debated. In some ways the MCNs are like the old Hollywood studio system where talent was ‘owned’ by the studio. Except in this case, the MCNs follow a model based upon volume which does not enable them to bring the kind of one-on-one talent development that the old studio system followed. That being said, the MCNs are much better equipped to identify and engage in the online dialogue that are building the stars of the future. Could the networks compete? At its core, success comes down to the best content. The traditional broadcast networks know content development better than anyone. They know how hard hits are to come by and what it takes to develop, produce and promote content with the best potential. They have much deeper experience, money and traditional platforms with millions of eyeballs to leverage. Their biggest challenge is unwinding themselves from all the legacy regulatory and licensing nonsense. If they can learn to think globally, be nimble and take risks more akin to their digital peers (Netflix & Amazon) they have a huge opportunity. If they can learn the needs of a new generation and engage in the two way dialogue required to create narrative across platform, they will have something no one else does. Some of their talent relationships are moving forward without them. Jerry Seinfeld, knew he could not experiment with digital within a traditional network, because they did not have the platform or the leeway to experiment and so he had to do it himself. Al Roker has become a digital believer experimenting with live apps like Meerkat and Periscope through his own production companies Al Roker Entertainment & Al Roker Labs. In both cases, what a miss for NBC! How can the networks sit back and watch the talent they launched move to digital platforms. Traditional networks hold deeper relationship with the media buyers and the advertisers themselves – something the MCNs covet. If they can only learn to sell beyond the traditional disruptive TVC. I also believe that many MCNs may soon be in trouble. A few, like Maker, will be lucky and get bought by the larger entertainment conglomerates. In some cases its easier to buy culture and approach than build it yourself. Many, if they cannot scale and gain deeper relationships with the creators and the Brands, will go under. Traditional publishing companies are also a threat. With print dropping subscribers, they were forced to digital a long time ago and have much more experience. In most cases they are developing video content to feature on their channels and are now competing with the best of them. From Huffpo to CosmoBody to Conde Nast Entertainment, the networks will be joining the party late. Take a look at one of my older posts: Are publishers the next networks. The traditional networks must start their own digital networks. Call them MCNs or whatever you want, but they need to get on it. Not in a way where they simply promote their broadcast shows, but in a way that allows them to lead a cross-platform, digital and mobile content revolution. This is not a case of simply innovating but it will be necessary for survival. Look at Kodak, once a global leader in image-making, they refused to see the digital migration. This entry was posted in All and tagged ABC, Amazon Prime, Awesomeness TV, Big Frame, Broadband TV, CBS, CNN, digital video, Fox, fullscreen, Machinima, Maker, maker studios, MCN, Multi Channel Network, NBC, Netflix, Revision 3, StyleHaul, Television Networks, YouTube. Bookmark the permalink. « Using Brand Data to develop the right content.